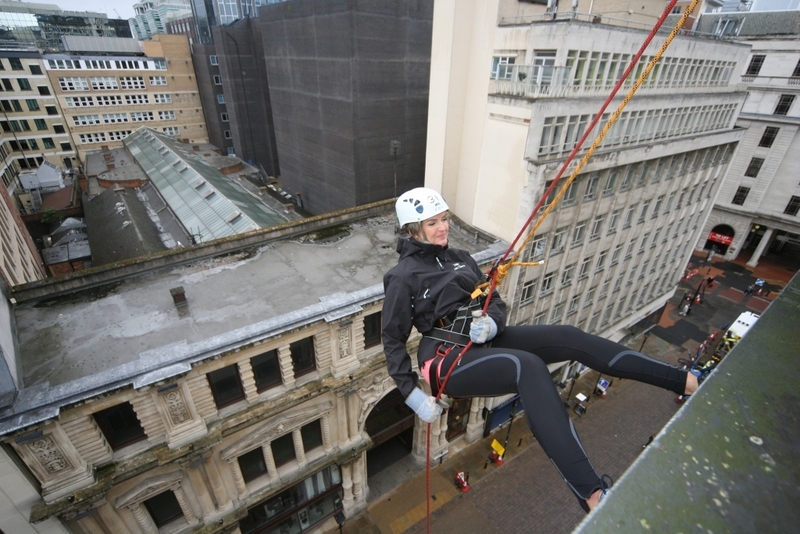 Supporters of Sandwell and West Birmingham Hospitals NHS Trust charity braved driving wind and rain to complete an abseil down the side of House of Fraser in Birmingham this week. The event was in memory of Birmingham City Hospital staff nurse Ramandeep Kaur, who died following an asthma attack, aged just 22. Doctors, nurses and staff from various other departments, including Chief Nurse Rachel Overfield, were joined by fundraisers from outside the NHS to raise money for local asthma services, as well as awareness of the condition that affects over five million people in the UK. Despite unseasonable weather, every courageous participant completed the abseil and even managed to smile for a photograph, taken as they stepped off the 100ft high roof, accompanied by applause and cheers from the safety of the pavement. The charity’s mascot, an almost life-size teddy bear named Challenge Charley, even got in on the action and completed the abseil, with the help of abseil instructors of course. Carly Jones, Head of Fundraising at Sandwell and West Birmingham Hospitals Charity said: “It’s fantastic that so many people have come to show their support for the event. We’re amazed by the courage of everyone including Challenge Charley, our fundraising mascot who also made the descent! “It is a reflection of how cherished Ramandeep was that the day has been so successful and we feel privileged to have been able to do this event in her memory. Sponsorship money is still being collected but over £2,000 has already been raised to help asthma patients in Sandwell and Birmingham. There is still time to sponsor the staff from Ward D17, where Ramandeep worked so if you’d like to show your support visit https://www.justgiving.com/teams/d17abseilers. Sandwell and West Birmingham Hospitals Charity supports City Hospital in Birmingham, Sandwell General Hospital and Rowley Regis Community Hospital as well as community healthcare services in its locality. If you would like to help raise money for Sandwell and West Birmingham Hospitals Charity please contact the SWBH Fundraising Team on 0121 507 5196 or email swbh.fundraising@nhs.net .